Clarksville, TN – The Austin Peay State University Department of Music was well represented at the Tennessee Music Education Association (TMEA)’s annual conference, held in April in Nashville at the Opryland Hotel. The APSU Clarinet Choir, under the direction of Dr. Spencer Prewitt, was among a number of student groups selected to perform at the conference. 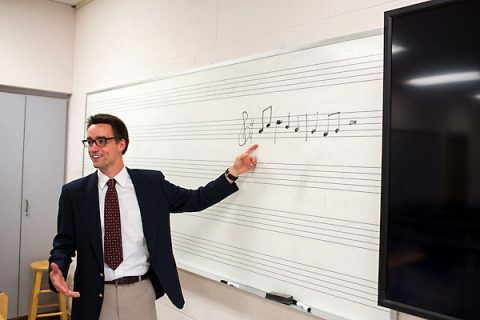 Austin Peay State University student Austin Ward fights for music education in Washington, D.C.
Clarksville, TN – Austin Peay State University music education student Austin Ward is far from a natural-born politician; his first love will always be music. However, Ward’s time as a university student has taught him that there is much more to music than just his instrument – and that music is worth fighting for at the highest levels of government.